Our client City of Holdfast Bay recently hosted the Stage 3 Start of the Santos Tour Down Under 2016 at Glenelg on Thursday 21 January. In line with tradition, a celebratory street party was held the evening before the big race. 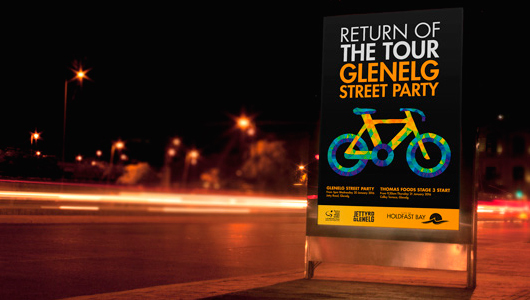 The City of Holdfast approached us to develop an exciting cycling inspired concept to promote the community event across a variety of collateral, including posters, web banners, bus shelters, entry signage and a large banner for Moseley Square. We designed a colourful geometric bike to represent the event and act as a recognisable symbol across all the collateral. The street party was a huge success with over 20,000 people attending.